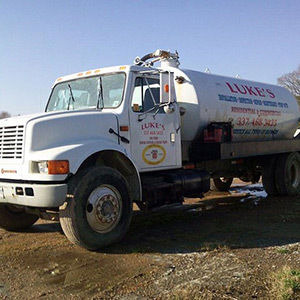 Since 1983, Luke’s Tank Pumping Service has been the number-one sanitation service in Mamou, Louisiana, offering installation, cleaning, pumping, repair and inspection services for your septic tank, along with a quality inventory of equipment and parts to help you get the job done right. Luke’s Tank Pumping Service specializes in services for your septic tank, sewer and grease trap to keep your system running smoothly and efficiently. We offer installation, maintenance and repair on sewers, septic tanks and grease traps for both residential and commercial properties, including pumping, inspections and industrial services for lift stations. We also specialize in manufacturing, installing and maintaining grease traps and Aerobic Treatment Units, utilizing our expert understanding of Louisiana’s unique soil composition to provide you with a far more efficient, healthy and environmentally friendly treatment system. We are fully licensed as a Master Plumber in Louisiana, license #743. We offer full septic and sewage service on residential, commercial and industrial systems. We’ve been providing quality septic and grease trap services in Lafayette and Mamou, LA, for more than 30 years. We proudly serve Lafayette and Mamou, LA, and the surrounding area within 60 miles.